OPI have over 200 shades and regularly release limited collections such as Oz the Great and Powerful collection, Vintage Minnie Mouse and now Couture de Minnie. Couture de Minnie is inspired by the most fashionable mouse ever - which could only be Minnie Mouse couldn't it. Minnie Mouse is very sophisticated, she’s a strong powerful lady who stands by her man while rocking her bows, polka dots and heels. 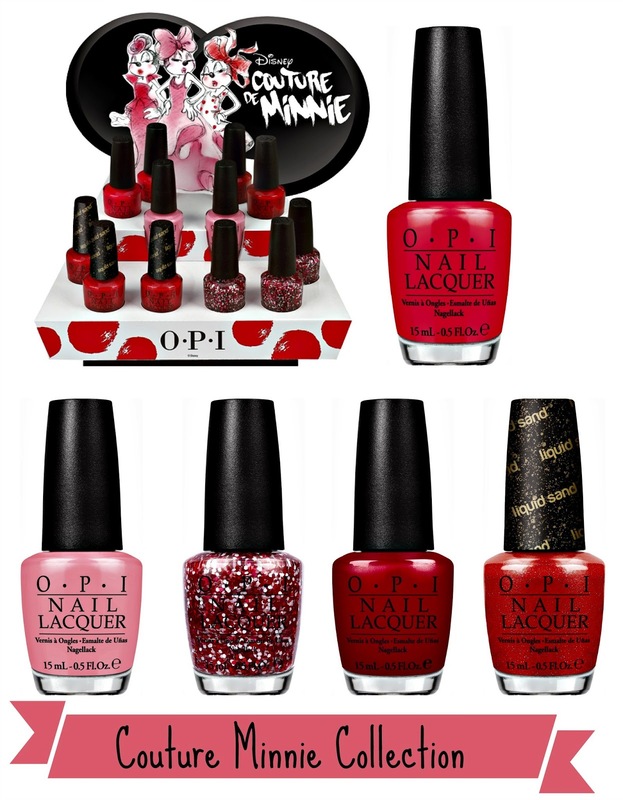 OPI decided to shake Minnie's style up with their vintage Minnie collection in 2012 proving to be very popular. They decided to shake up her style yet again for 2013 bringing out her glamorous inner diva. So far I've noticed each collection contains a liquid sand textural polish. I have read some other blogs where they absolutely hate these polishes but personally, I adore them. I would jump all over a full collection of liquid sand why? I hate chipping, I hate having to re-do my manicure every few days and as a perfectionist I hate when polish just doesn't look immaculate. Liquid sand applies so easily in 1 quick swatch, it stays on my nails for well over 7 days without chipping and because of the irregular texture you don't notice any flaws. Liquid sand isn't suppose to be worn with a topcoat but... you can apply a topcoat if you want a smoother result. Magazine Cover Mouse // Sparkling liquid sand strawberry polish that will surely hit the headlines. Minnie Style // A white and read glitter polish that oozes style and playfulness. A Definite Moust-Have // A covet-able fuchsia. Innie Minnie Mightie Bow // Catch this crimson by the toe. Each OPI polish contains their 'pro-wide' brush. In all honesty I haven't noticed anything stand out about the brush although OPI polishes do apply easier than say Nails Inc. In all honestly I've found Rimmel's chunky square bristle brushes the best. Couture Minnie collection will be available in June 2013 and will cost $9.00 in America and 'possibly' around £12 in the UK. To get your hands on this collection as well as the 2012 Vintage Minnie set and other OPI goodies, you can head over to my ‘Inspired by Minnie’ board over on Shopcade.